The end of Summer is upon us, and we have the last few remnants of vegetables from our garden to use up. 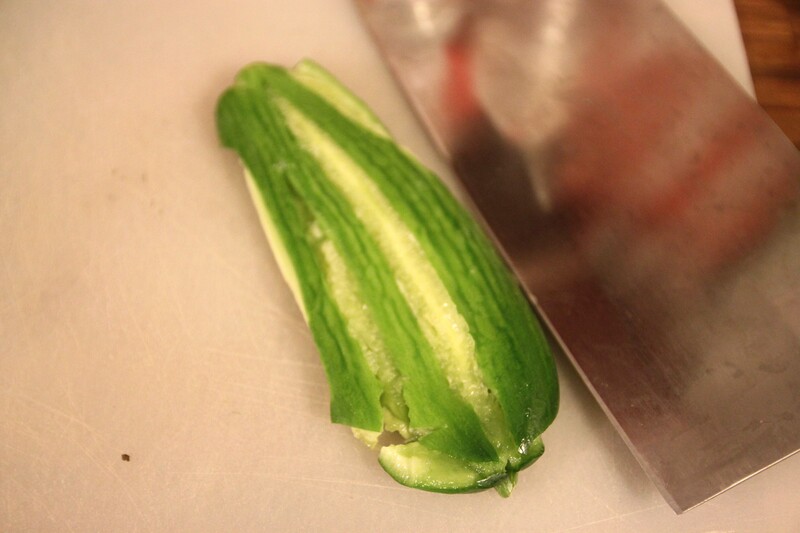 We found we had a straggling cucumber that had met its old age, and was ready to be put into our bellies. 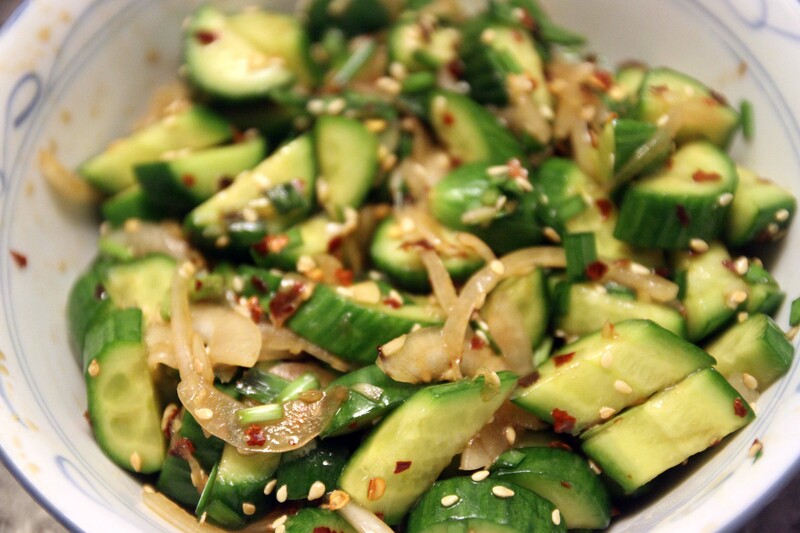 Jax absolutely loves Taiwanese style pickled cucumbers, whereas I like spicy Korean style. We had watched a show on TV that made Japanese style. Our compromise? Make them all! 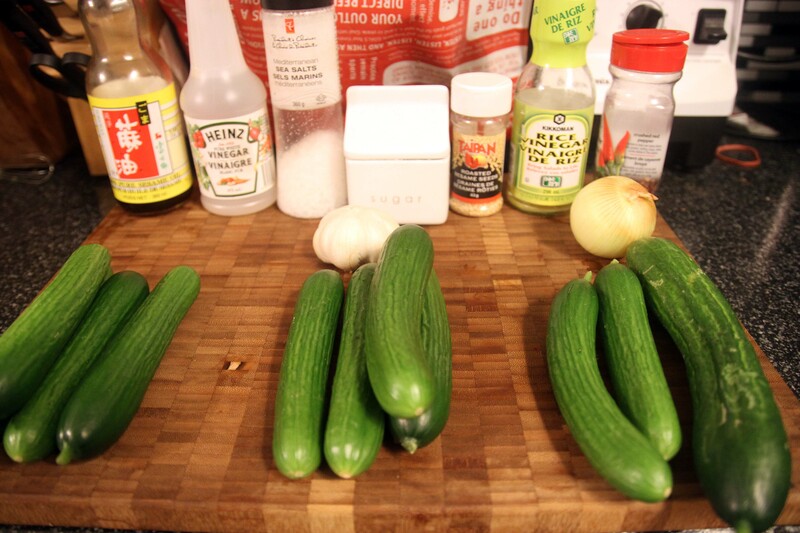 This is SUPER easy to do, and makes a great accompaniment to any meat dish, especially barbeque meats. 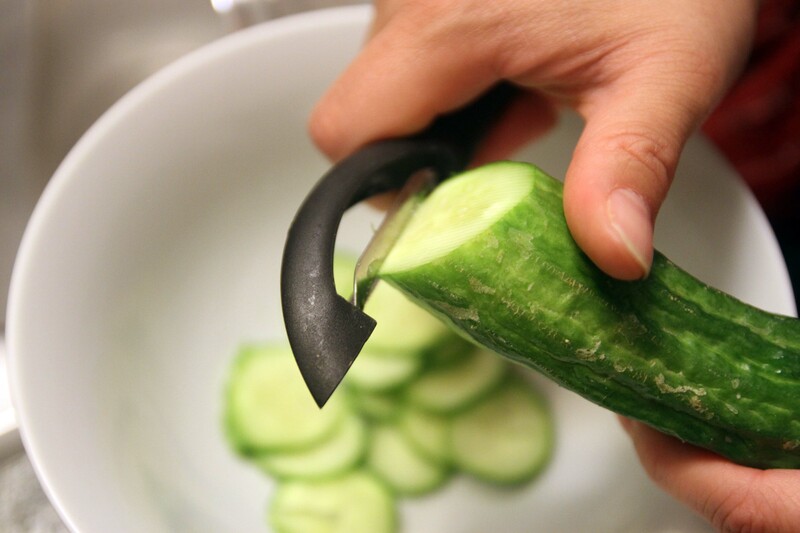 Slice the cucumbers thinly. 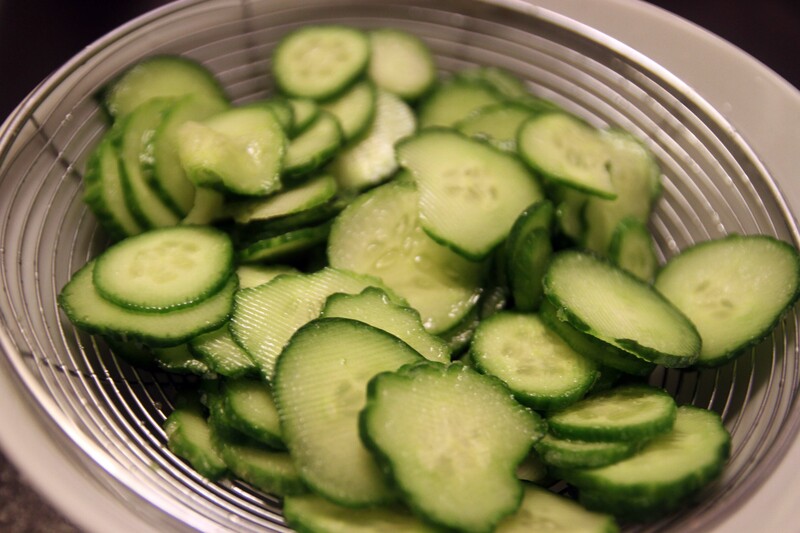 I used a vegetable peeler to make them uniform. 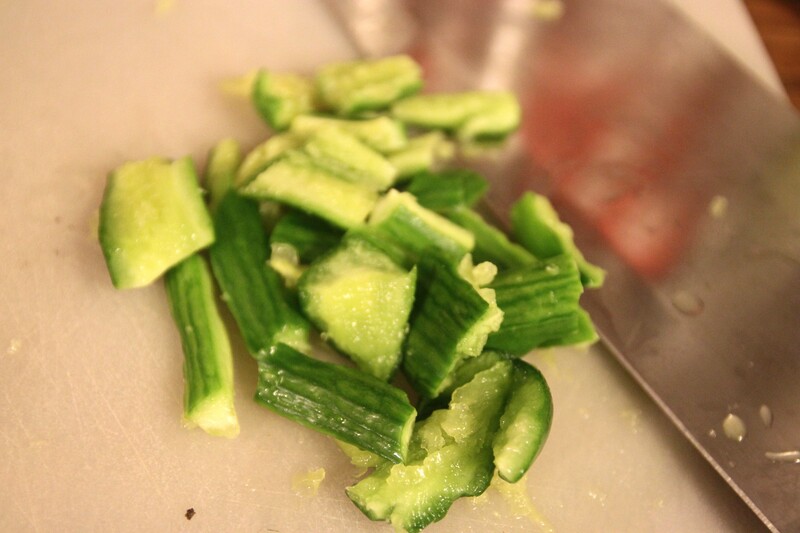 Sprinkle the salt over the cut pieces, and give it a stir. Drain all of the excess water. Using a strainer over a bowl works wonders. After 1-2 hours, they will be dried quite well. Throw all of the ingredients together, and mix well. 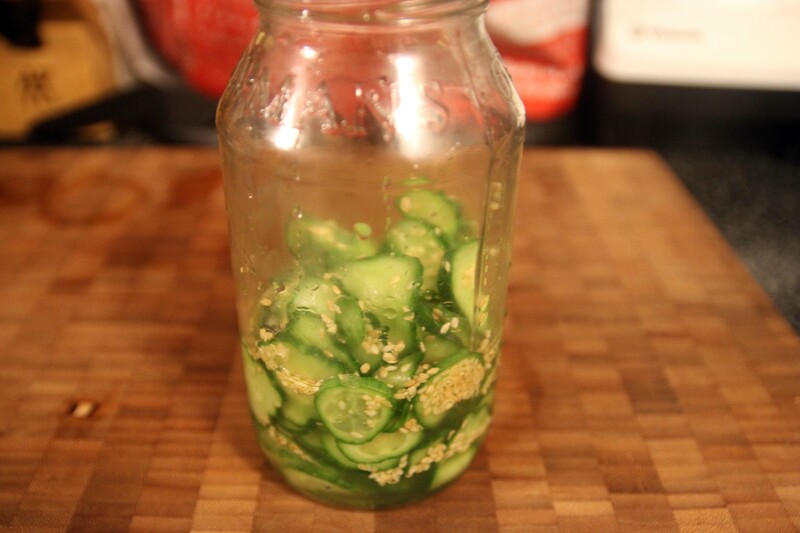 Place in a jar and refrigerate overnight. That’s it! 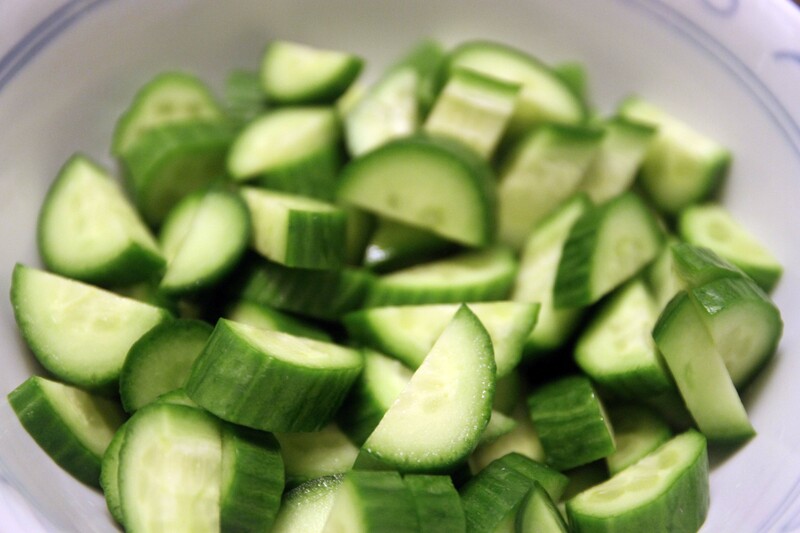 Cut each cucumber in half, and then make diagonal slices. Unlike the Japanese style, these do not need to be paper thin. Prep the garlic, chives, and onions. 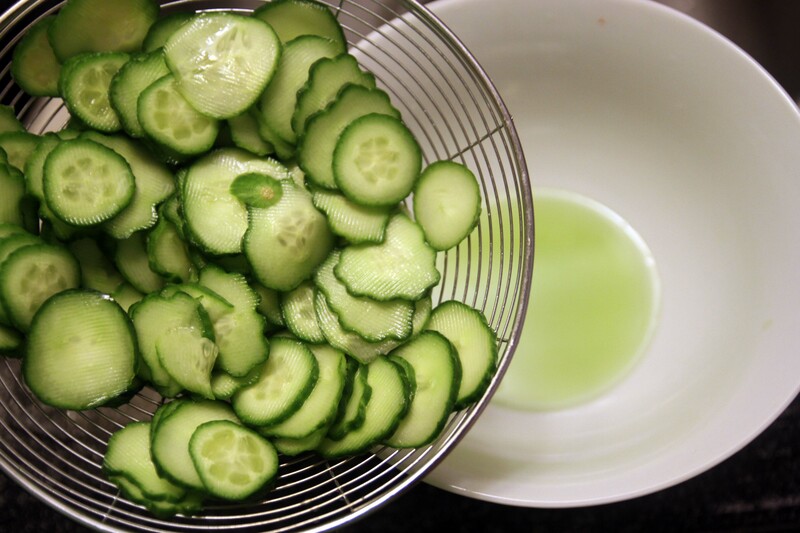 Once again, unlike the Japanese style cucumber dish, you do not need to drain the moisture. 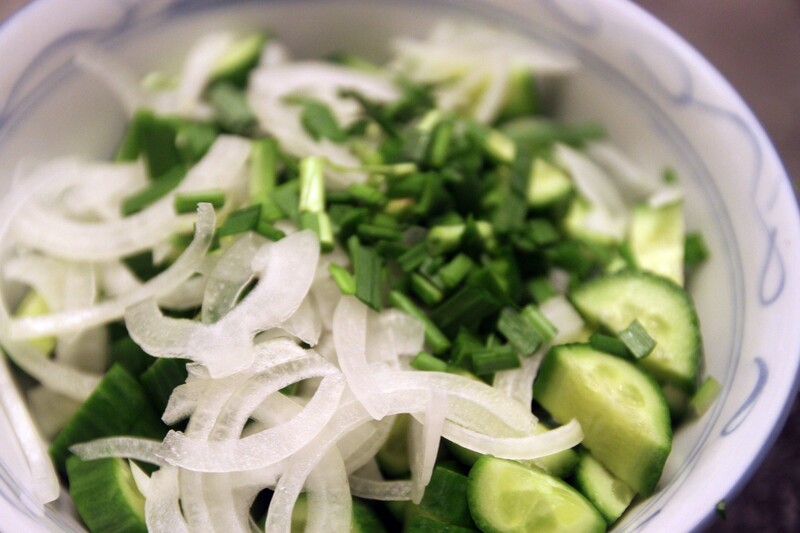 Throw each ingredient into the bowl and give it a stir. Finally add each sauce, and mix well. No need to refrigerate these overnight — these are now ready to eat right away! 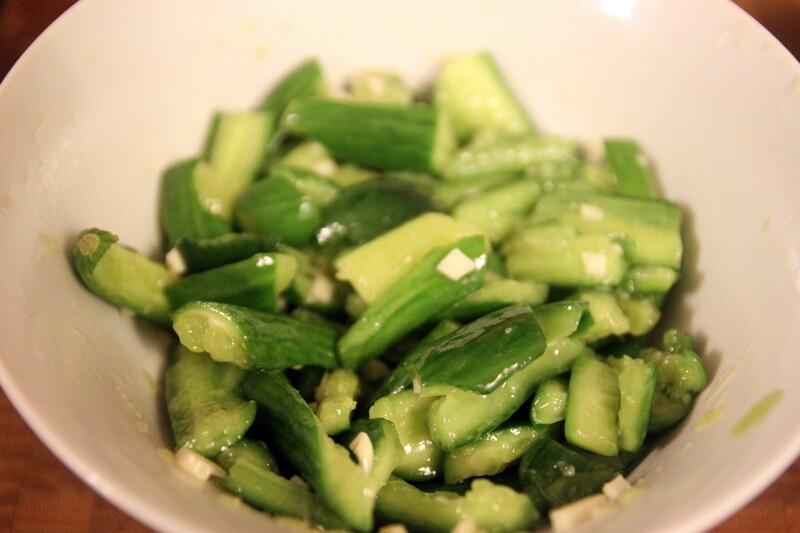 If you do wait 2 hours, the chili flakes will work their flavour into the cucumber, so be warned! It will get hotter! 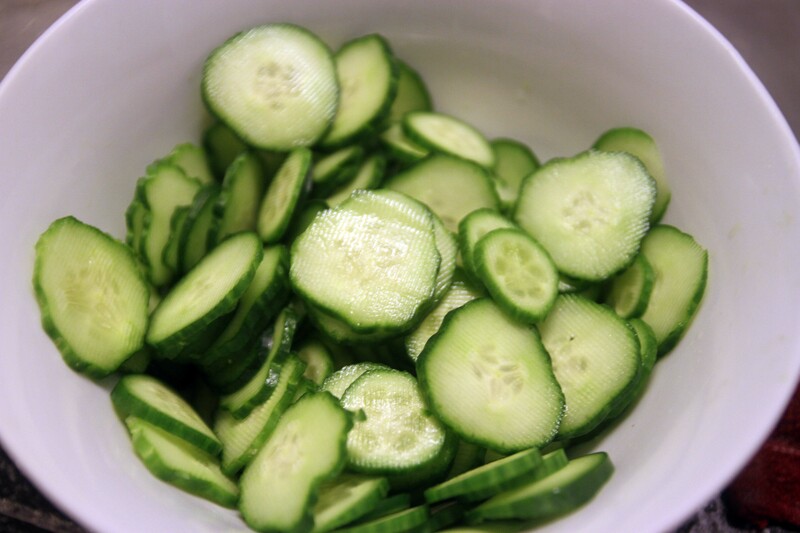 Smash the cucumbers, and the break with your hands. Yes, you heard correctly. I did this by using the wide, flat side of my chopper to smash, and then the rest broke apart easily. When you break it with your hand, a lot of moisture is released. 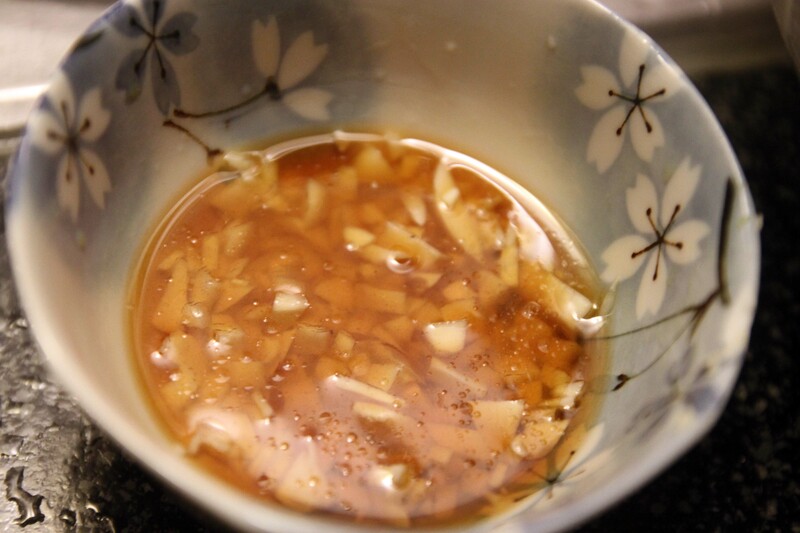 Like the Japanese style, coat these with the sugar and salt, and put it in a strainer and let it drain for 1 to 2 hours. When ready, mix the remaining ingredients together. 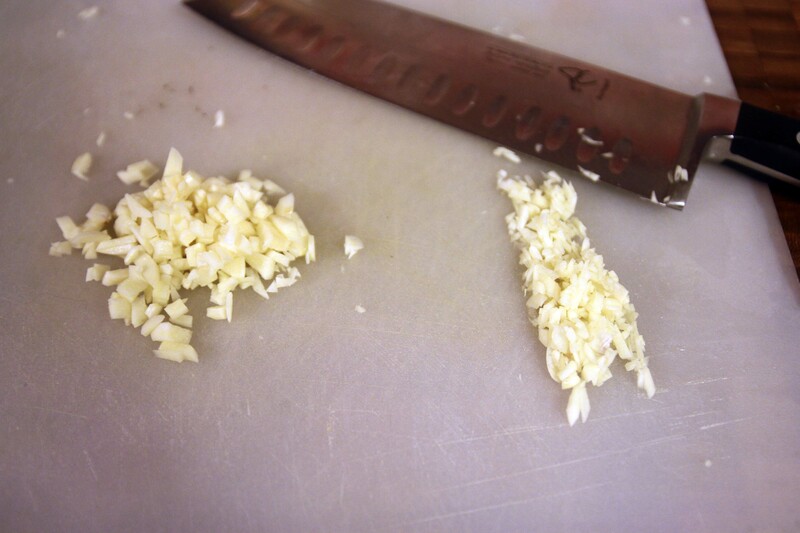 Mince your garlic. Jax likes hers with a little texture, so we just diced them instead. Throw ’em all together, and give it a mix. 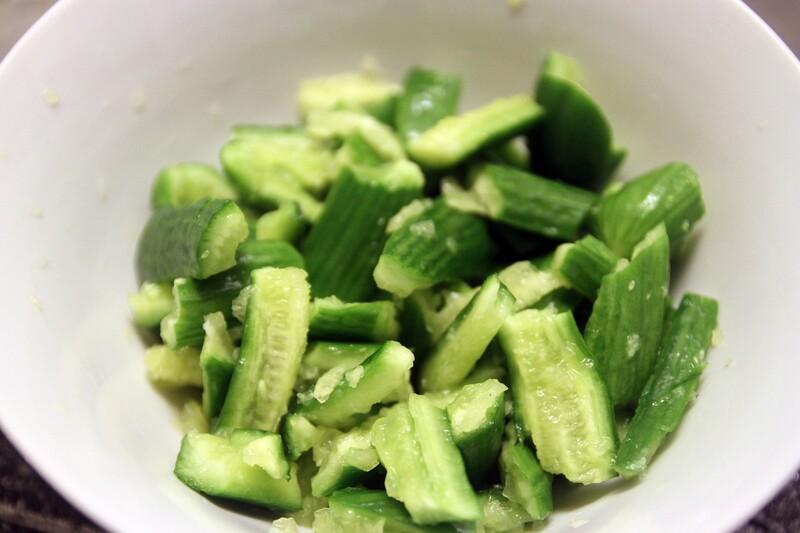 You can refrigerate these as well, which will bring out the flavour quite nicely. Ta da! 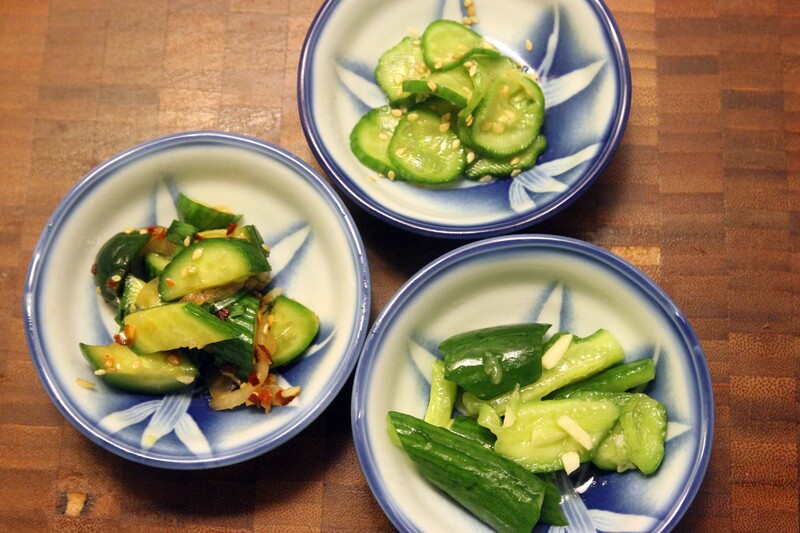 There you have it, Asian Pickled Cucumbers Three Ways — each with it’s own unique and distinctive flavour, and each SUPER simple to make!